You'll get in some beach time at Blenheim Beach and Callala Beach. Eschew the tourist crowds and head to Greenfield Beach and Nelson Beach. Explore Jervis Bay's surroundings by going to Artemis Wines (in Mittagong), Berrima District Museum (in Berrima) and Rosemont The Patchwork Shop (in Mogo). There's lots more to do: enjoy the sand and surf at Malua Bay Beach, explore the wealth of natural beauty at Abrahams Bosom Reserve, tour the pleasant surroundings at Honeymoon Bay, and enjoy the sea views from Cape St George Lighthouse. For reviews, maps, more things to do, and more tourist information, use the Jervis Bay trip planner. Dresden, Germany to Jervis Bay is an approximately 30-hour flight. The time zone changes from Central European Time to Australian Eastern Standard Time (New South Wales), which is usually a 9 hour difference. 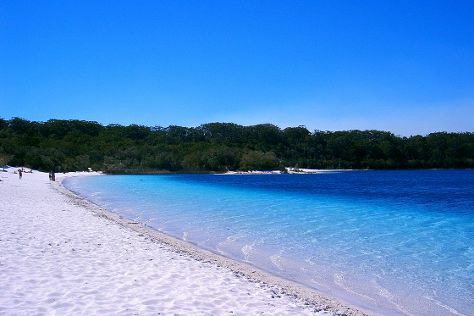 Traveling from Dresden in April, expect Jervis Bay to be somewhat warmer, temps between 26°C and 14°C. Finish your sightseeing early on the 7th (Sun) to allow enough time to take a train to Sydney. 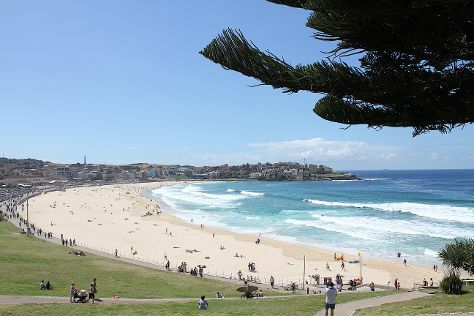 You'll enjoy a bit of beach vacationing at Bondi Beach and Shelly Beach. Get outdoors at Manly Beach and Bondi to Coogee Beach Coastal Walk. Explore the numerous day-trip ideas around Sydney: Bouddi National Park (in Killcare) and Illawarra Grevillea Park (in Bulli). There's lots more to do: catch a live performance at Sydney Opera House, wander the streets of Darling Harbour, enjoy the sand and surf at Camp Cove, and tour the pleasant surroundings at Clovelly. To see maps, reviews, where to stay, and tourist information, read Sydney trip planner . Traveling by train from Jervis Bay to Sydney takes 4.5 hours. Alternatively, you can take a bus; or do a combination of bus and train. In April, daily temperatures in Sydney can reach 26°C, while at night they dip to 17°C. Finish up your sightseeing early on the 12th (Fri) so you can go by car to Katoomba. Get in touch with nature at Wentworth Falls and Pulpit Rock Lookout. Do some cultural sightseeing at Dryridge Estate and Street Art Walk - by Street Art Murals Australia. And it doesn't end there: hike along The Giant Stairway, head outdoors with Evans Lookout, see the interesting displays at Lithgow Small Arms Factory Museum, and contemplate the waterfront views at Wentworth Falls Lake. To see photos, reviews, traveler tips, and more tourist information, go to the Katoomba road trip website . Getting from Sydney to Katoomba by car takes about 1.5 hours. Other options: take a train. Expect little chillier evenings in Katoomba when traveling from Sydney in April, with lows around 14°C. Cap off your sightseeing on the 15th (Mon) early enough to travel to Byron Bay. Satisfy your inner culture vulture at Tweed Regional Gallery & Margaret Olley Art Centre and Captain Cook Memorial and Lighthouse. You'll explore the less-touristy side of things at Burleigh Head National Park and Lennox Head Beach. Explore the numerous day-trip ideas around Byron Bay: Yamba (Yamba Pedal Boats & Pippi Beach), Greenmount Beach (in Coolangatta) and Spooky Beach (in Angourie). Spend the 20th (Sat) exploring nature at Springbrook National Park. There's still lots to do: stroll through Wategos Beach, get great views at Broken Head Nature Reserve, view the masterpieces at Hammer and Hand Byron Bay Jewellery and Metal Collective, and enjoy the sand and surf at Belongil Beach. To see other places to visit, more things to do, reviews, and tourist information, read Byron Bay vacation builder site . You can do a combination of train, flight, and bus from Katoomba to Byron Bay in 7 hours. Alternatively, you can drive; or do a combination of train and bus. April in Byron Bay sees daily highs of 30°C and lows of 16°C at night. Cap off your sightseeing on the 20th (Sat) early enough to travel to Fraser Island. You'll enjoy a bit of beach vacationing at Seventy-Five Mile Beach and Eli Creek. You'll explore the less-touristy side of things at Lake McKenzie and Lake Birrabeen. For other places to visit, maps, and more tourist information, read our Fraser Island itinerary maker app . Traveling by combination of car and ferry from Byron Bay to Fraser Island takes 9.5 hours. Alternatively, you can do a combination of bus, train, car, and ferry; or do a combination of bus, ferry, and car. Wrap up your sightseeing on the 24th (Wed) early enough to travel to Whitsunday Island. Kick off your visit on the 25th (Thu): step off the mainland to explore Whitsunday Islands National Park. For other places to visit, maps, more things to do, and tourist information, read our Whitsunday Island trip itinerary planning app . Getting from Fraser Island to Whitsunday Island by combination of car, ferry, and flight takes about 9 hours. Other options: do a combination of car, ferry, and train; or do a combination of car, ferry, and bus. April in Whitsunday Island sees daily highs of 32°C and lows of 22°C at night. Cap off your sightseeing on the 25th (Thu) early enough to travel to Magnetic Island. Kick off your visit on the 26th (Fri): kick back and relax at Geoffrey Bay, then identify plant and animal life at Nelly Bay to Arcadia Trail, and then explore the galleries of Magnetic Island Museum. Here are some ideas for day two: appreciate the extensive heritage of Magnetic Island Forts Walk and then tour the water at your own pace with Big Mama Sailing. For where to stay, reviews, ratings, and more tourist information, you can read our Magnetic Island trip itinerary builder tool . Do a combination of bus and ferry from Whitsunday Island to Magnetic Island in 5 hours. Alternatively, you can do a combination of train and ferry; or do a combination of flight and ferry. In April, plan for daily highs up to 35°C, and evening lows to 24°C. Finish up your sightseeing early on the 27th (Sat) so you can catch the ferry to Townsville. Step off the beaten path and head to The Strand and The Drill Hall Studio. Museum of Tropical Queensland and Pinnacles Gallery are good opportunities to explore the local culture. The adventure continues: look for all kinds of wild species at Billabong Sanctuary, brush up on your military savvy at Royal Australian Air Force Townsville Museum, and take a tour by water with Boat Tours & Water Sports. To find photos, other places to visit, traveler tips, and other tourist information, go to the Townsville trip itinerary planning site . Townsville is just a stone's throw from Magnetic Island. In April in Townsville, expect temperatures between 35°C during the day and 24°C at night. Cap off your sightseeing on the 30th (Tue) early enough to travel to Port Douglas. Escape the urban bustle at Scuba & Snorkeling and Four Mile Beach. You'll discover tucked-away gems like Wildlife Habitat Port Douglas and St Mary’s by The Sea chapel. Spend the 4th (Sat) spotting exotic species with a safari tour. Next up on the itinerary: experience rural life at Hartley's Crocodile Adventures, learn about winemaking at Shannonvale Tropical Fruit Winery, and view the masterpieces at Des Spencer Galleries. To find other places to visit, photos, reviews, and more tourist information, you can read our Port Douglas road trip site . Do a combination of flight and shuttle from Townsville to Port Douglas in 4.5 hours. Alternatively, you can drive; or do a combination of bus and shuttle. April in Port Douglas sees daily highs of 34°C and lows of 25°C at night. Cap off your sightseeing on the 4th (Sat) early enough to travel to Cape Tribulation. Step out of the city life by going to Daintree National Park and Cape Trib Farm. Explore hidden gems such as Daintree Rainforest - Cooper Creek Wilderness and Cow Bay Beach. When in Cape Tribulation, make a side trip to see Daintree Discovery Centre in Cow Bay, approximately 30 minutes away. The adventure continues: view the masterpieces at Floravilla Ice Cream Factory. To find photos, other places to visit, where to stay, and other tourist information, go to the Cape Tribulation day trip planner . Do a combination of car and ferry from Port Douglas to Cape Tribulation in 2 hours. Alternatively, you can take a bus. In May, daily temperatures in Cape Tribulation can reach 32°C, while at night they dip to 24°C. Finish up your sightseeing early on the 7th (Tue) so you can catcht the bus to Cairns. Get some cultural insight at The Crystal Caves and Samurai Gallery Australia. You'll get in some beach time at Trinity Beach and Yorkeys Knob Beach. Explore Cairns' surroundings by going to Curtain Fig National Park (in Yungaburra), Spy & Camera Museum (in Herberton) and Babinda Boulders (in Babinda). Spend the 10th (Fri) among aquatic life with a scuba or snorkeling tour. There's much more to do: look for all kinds of wild species at Australian Butterfly Sanctuary, admire the masterpieces at Cairns Art Gallery, relax in the rural setting at Jaques Coffee Plantation, and take the plunge with a skydiving experience. To find photos, other places to visit, reviews, and other tourist information, read our Cairns route builder tool . You can take a bus from Cape Tribulation to Cairns in 3.5 hours. Another option is to drive. In May, daytime highs in Cairns are 32°C, while nighttime lows are 24°C. Finish your sightseeing early on the 14th (Tue) to allow enough time to travel back home.